StarWind iSCSI SAN allows you to build your own high availability SAN at an affordable price. In less than 30 minutes you can have a high performance, reliable and scalable shared storage for your server applications that is very easy to manage and administer. Support for iSCSI Standards: IPSec, CHAP, MPIO, VSS are all fully supported in StarWind. StarWind iSCSI SAN software platform runs on standard enterprise-class x86 or x64 servers, from blades to rack servers. This allows customers to choose from any standard hardware that meets performance, scalability and budget requirements. More importantly, the use of standard servers makes it easy to upgrade to new hardware, faster memory, Nehalem processors, PCI Express RAID controllers or 10 GigE networking that will all improve the performance of the storage appliance built with StarWind. StarWind Software is an award-winning, recognized global leader in Storage Virtualization and iSCSI storage since 2003. 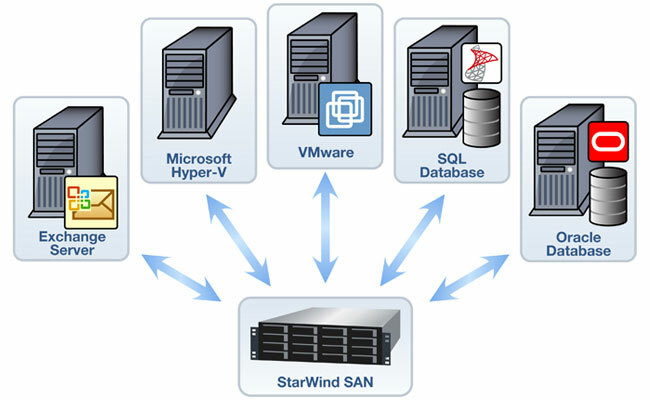 StarWind's flagship product is a storage virtualization software that turns any industry-standard Windows Server into a high availability SAN and is designed for use with server clusters for server applications such as VMware, Hyper-V, Microsoft SQL Server, Microsoft Exchange, Microsoft SharePoint Server and others. The enterprise-class features include high availability storage architecture with synchronous data mirroring and automated failover and failback, remote replication across a WAN, CDP and snapshots, thin provisioning and virtual tape array (VTA). Since 2003, StarWind has pioneered the IP SAN industry and has been the solution of choice for over 30,000 global users in over 100 countries, from small and midsize companies, to governments, and Fortune 1000 companies.